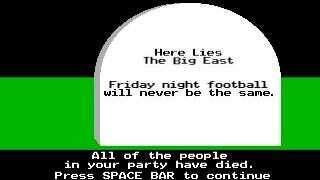 With the Big East ceding its name to the breakaway faction of basketball schools known as the Catholic 7, the old, orphaned Big East has until July 1 to come up with something to call itself. And while there's been no official announcement, ESPN's Brett McMurphy is reporting that the a favorite has emerged, and that the league's law firm has already registered various domain names affiliated with that favorite: The America 12 Conference. America 12! The Old Big East no longer has any geographic identity, it has essentially absorbed Conference USA, and no one outside the league office can keep track of which members in what time zones are coming and going. (Here's a guide.) Not only that, but the name America 12 means the Old Big East won't have to do this again once Cincinnati and UConn finally get around to bolting for the ACC or the Big Ten in the next year or two. So why not America 12? Of course, the league still has to add a 12th member. And it'll have to hope like hell that school actually stays.